I'm of two minds about Wikipedia. I think it's a great resource for quick lookups, and use it myself for that sort of thing. A study by Thomas Chesney found that experts generally consider Wikipedia to be pretty accurate, although the same study admits that others have concluded that 13% of Wikipedia entries have errors (how serious those errors are is uncertain; an error in a single date is certainly more forgivable than one that gives erroneous information about a major world event). Another study concluded that between one-half and one-third of deliberately inserted errors are corrected within 48 hours. But still. That means that between one-half and two-thirds of deliberately inserted errors weren't corrected within 48 hours, which is troubling. Given the recent squabbles over "fake news," having a source that could get contaminated by bias or outright falsehood, and remain uncorrected, is troubling. Plus, there's the problem with error sneaking in, as it were, through the back door. Sometimes claims are posted on Wikipedia (and elsewhere) by people who honestly think what they're stating is correct, and once that happens, there tends to be a snake-swallowing-its-own-tail pattern of circular citations, and before you know it, what was a false claim suddenly becomes enshrined as fact. As an example of this, consider the strange case of the Swanson conversion. The Swanson conversion, which sounds like the title of an episode of The Big Bang Theory but isn't, is a piece of the reaction of cellular respiration. Without geeking out on this too extremely -- and my students will attest that I get way too excited about how cool cellular respiration is -- the background on this is as follows. 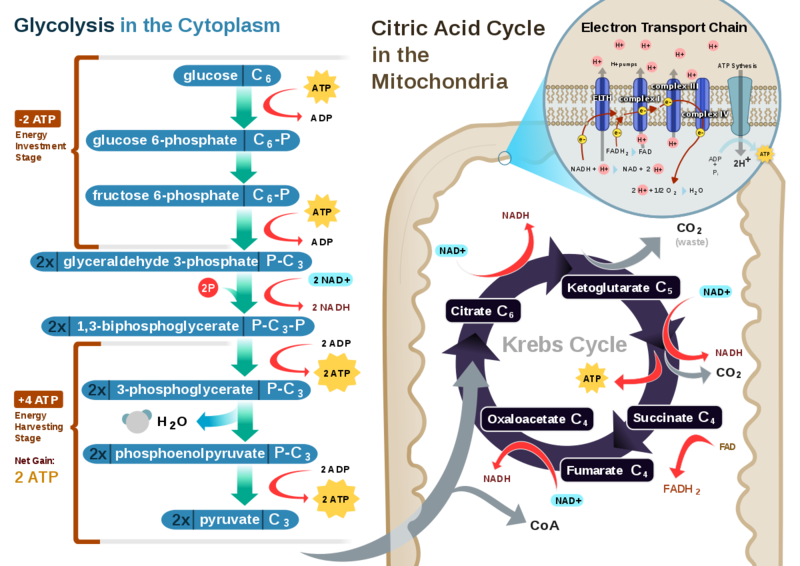 Cellular respiration, which is the set of reactions by which our cells burn glucose and release energy to power everything we do, has three major steps: glycolysis, the Krebs cycle, and the electron transport chain. Each of those is made of dozens of sub-reactions, which I will refrain from describing (although like I said, they're extremely cool). But there's one piece of it that doesn't have an official name, and that's the step that links glycolysis (the first step) to the Krebs cycle (the second step). Again, trying not to be too technical, here, but at the end of glycolysis, the original glucose molecule has been split in two (in fact, "glycolysis" is Greek for "sugar breaking"). The two halves are called pyruvate, and they're three-carbon compounds. Before they can be thrown into the Krebs cycle, however, they have to lose one carbon (in the form of carbon dioxide), thus forming acetate, which can be introduced into the first step of Krebs. So what's that carbon-losing step called? Apparently, "the Swanson conversion." It's in Wikipedia, not to mention many other websites describing the reactions of respiration. ... especially when one of his students posted it to Wikipedia as the correct name. When Swanson found out, he at first was annoyed, but after discussing it with his students, allowed it to remain as a test to see how quickly errors on Wikipedia were corrected. And... it wasn't. In fact, others who have wondered, as my students did, why this step doesn't have a name stumbled on this and thought, "Cool! Now I know what to call it!" and posted it on their websites. And now, this name that started out as an inside joke between a biology teacher and his students has become the semi-official name of the step. Swanson, for his part, says he uses it as an example of how you can't trust what's online without checking your sources. The problem is, how do you check the sources on something like this? Once the aforementioned self-referential merry-go-round has been engaged, it becomes damn near impossible to figure out what's correct. Especially in cases like this, which is that the correct answer to "what is the name of ____?" is, "There isn't one." All too easy to say, "Well, I guess this one must be correct, since it's all over the place." I realize this is a pretty unique situation, and I'm not trying to impugn the accuracy of Wikipedia as a whole. I still use it for looking up simple facts -- after all, I'm from the generation during whose childhood if you wanted to know what year Henry VIII was crowned King of England, and didn't have an encyclopedia at home, you had to get in your car and drive to the library to look it up. I think Wikipedia, errors and all, is a pretty significant step upward. However, it does mean that we need to keep our brains engaged when we read stuff on the internet -- and, as always, try to find independent corroboration. Because otherwise, we'll have people believing that one of the reactions of photosynthesis is called "the Bonnet activation." And heaven knows, we wouldn't want that. There's sort of a... philosophical issue here. What's your basis for saying the information is incorrect? Things are named (and words have meaning) by consensus. It always starts out that a very small group of people -- possibly one -- decides what to call something, and others pile on. Sometimes two or more groups come up with names for the same thing, and then when they meet up, they fight it out for a new consensus on what the "right" name is. But in the case where there's not a competition, at no point do you get to say the new name is "wrong." It's just not widely accepted yet. So if there's an OLD thing that nobody bothered to give a name to, and someone decides to plant their flag there, how is that misinformation? It helps people talk about something that was previously awkward to talk about, so it's a benefit. Admittedly, it's more usual for the discoverer of something (or the discoverer's graduate advisor) to propose the name, but this can't be the only case where it didn't happen that way.